January | 2013 | CCIE, the beginning! The purpose of this lab is to show the flexibility of Layer2 VPN technology AToM (Any Transport over MPLS), which allows service providers to smoothly transit the core network from legacy layer2 technologies into a single MPLS infrastructure ready for customer IPv6 transport. 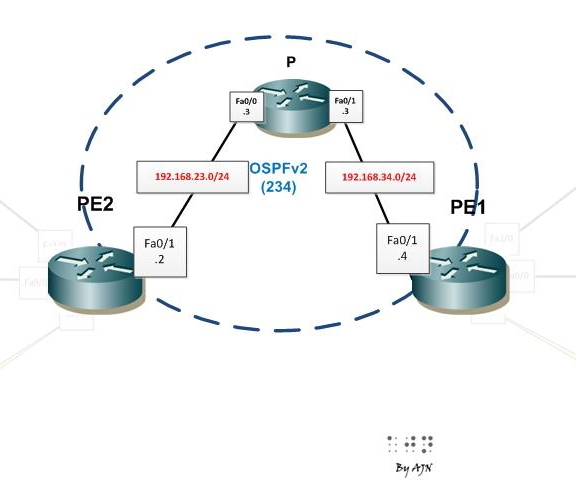 Customer transition from IPv4 to dual stack is as easy as adding an IPv6 configuration to a point-to-point segment. Let’s consider the following lab topology: one core MPLS and three customers. 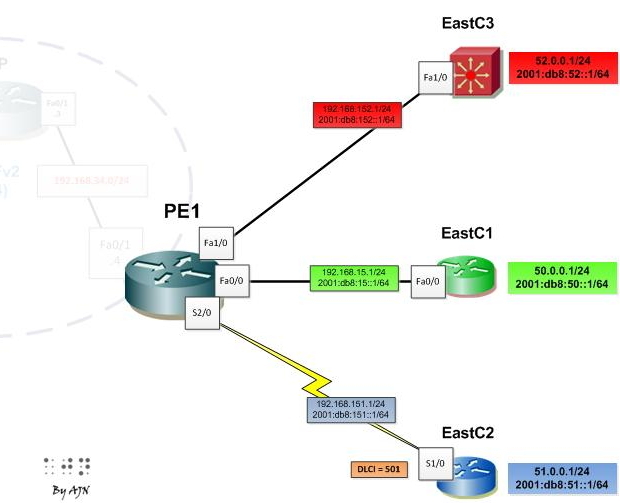 Customer1 uses Ethernet port-to-port layer2 circuit to connect to Provider Edge access router, Customer2 uses Ethernet VLAN layer2 circuit and customer3 uses Frame Relay layer2 circuit. The MPLS core is configured independently from any pseudowire configuration. In the core MPLS, there is practically nothing special to do. IGP and LDP configuration is straightforward. The goal is to guarantee core stability. Make sure LDP router id is forced to a loopback interface. The configuration to establish the different pseudowires do not depend on client configuration. 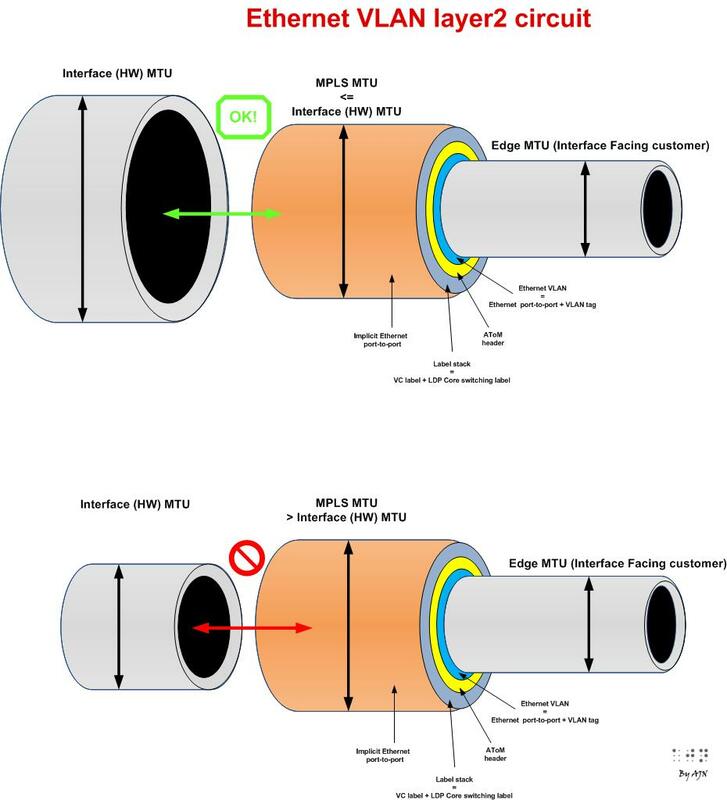 Note for each virtual circuit a directed LDP session is established between PEs connecting customer sites. Each PE uses a /32 loopback IP. Note the provider edge is configured independently of the client layer3 protocol IPv4/IPv6. Customer devices are configured in dual stack. Use sub-interface on PE and disable CDP on the main interface. For the west side the client configuration is mirrored. The offline lab provides a complete access to outcomes of large range of commands related to AToM. Frame Relay encapsulation (Cisco) = 2 bytes. (config-if)# mtu <>: The maximum packet length the interface can support. 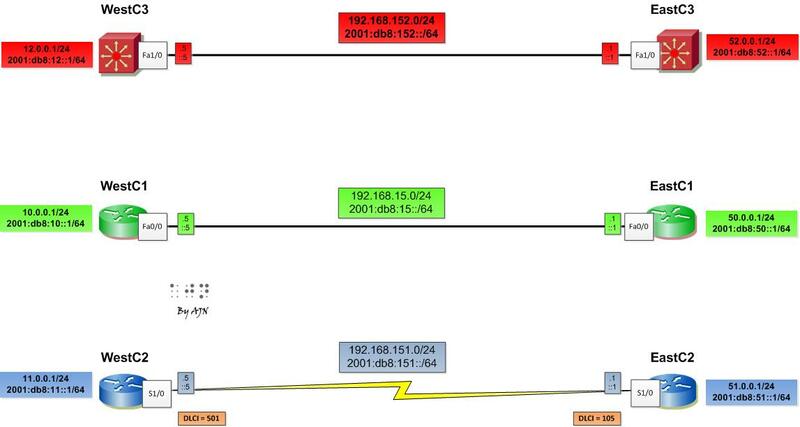 (config-if)# ip mtu <>: The maximum size of a non-labelled IP packet without fragmentation. (config-if)# mpls mtu <>: The maximum size of a labelled IP packet without fragmentation (<= Hardware MTU). Ivan Pepelnjak provides an excellent article about the difference between different MTU commands. This lab was performed on GNS3 and I had some difficulties building MPLS core using C7200 platform with IOS 12.4(24) as P router. 3700 platform IOS doesn’t allow me to change Hardware MTU. So the following test is done considering the maximum MTU through MPLS core of 1500 bytes. Note that ping fails starting from a packet size of 1472. EoMPLS VLAN pseudowire adds 30 bytes to 1472 bytes which makes the packet bigger than 1500 bytes (lab max MTU limitation). In fact, beyond the configured MTU on the core MPLS there is an implicit 18 bytes of the underlying Ethernet. AToM pseudowires are configured independently of IPv4/IPv6, which makes the client transition from IPv4 to IPv6 transparent. From the client point of view it is a directly connected point-to-point circuit. Make sure MPLS core interfaces MTU are configured with the maximum packet size and the MPLS MTU is not bigger that interface hardware MTU to avoid unnecessary fragmentation.